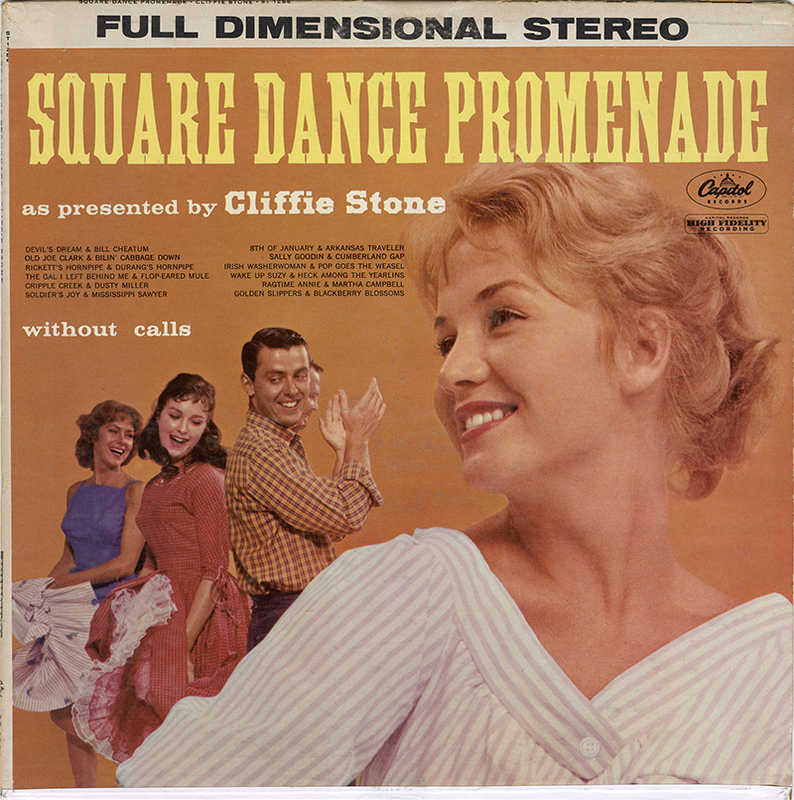 SCVHistory.com LW3459 | Film-Arts | Cliffie Stone Presents 'Square Dance Promenade' LP 1959. 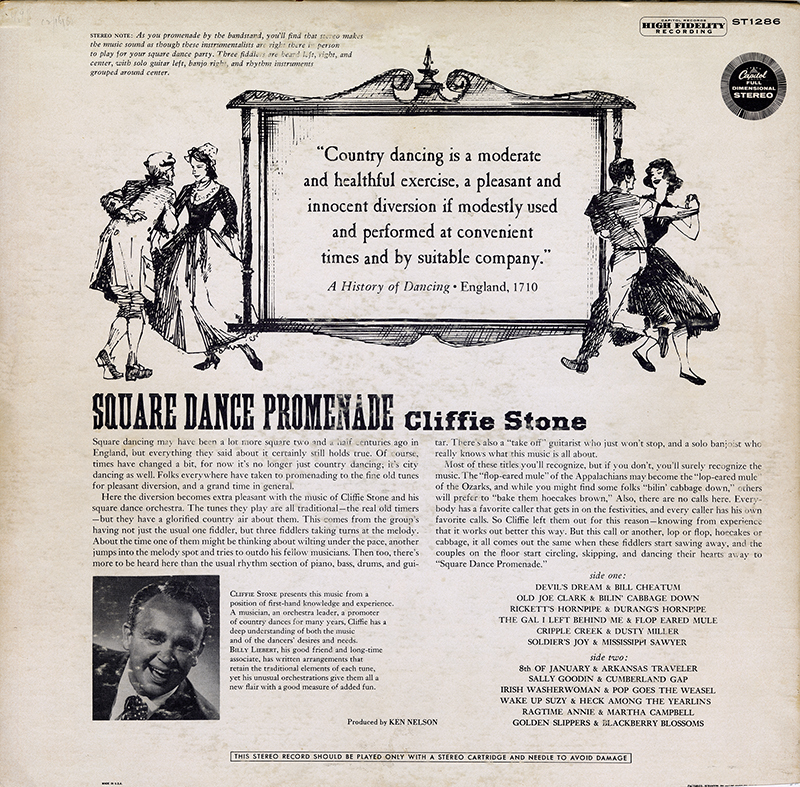 Sand Canyon's most famous resident of the mid-20th Century, Cliffie Stone, and his orchestra record "Square Dance Promenade" for Capitol Records, 1959. Square dancing may have been a lot more square two and a half centuries ago in England, but everything they said about it certainly still holds true. Of course, times have changed a bit, for now it's no longer just country dancing; it's city dancing as well. Folks everywhere have taken to promenading to the fine old tunes for pleasant diversion, and a grand time in general. Here the diversion becomes extra pleasant with the music of Cliffie Stone and his square dance orchestra. The tunes they play are all traditional &mdash; the real old timers &mdash; but they have a glorified country air about them. This comes from the group's having not just the usual one fiddler, but three fiddlers taking turns at the melody. About the time one of them might be thinking about wilting under the pace, another jumps into the melody spot and tries to outdo his fellow musicians. Then too, there's more to be heard here than the usual rhythm section of piano, bass, drums, and guitar. There's also a "take off" guitarist who just won't stop, and a solo banjoist who really knows what this music is all about. Most of these titles you'll recognize, but if you don't, you'll surely recognize the music. The "flop-eared mule" of the Appalachians may become the "lop-eared mule" of the Ozarks, and while you might find some folks "bilin' cabbage down," ethers will prefer to "bake them hoecakes brown," Also, there are no calls here. Everybody has a favorite caller that gets in on the festivities, and every caller has his own favorite calls. So Cliffie left them out for this reason &mdash; knowing from experience that it works out better this way. But this call or another, lop or flop, hoecakes or cabbage, it all comes out the same when these fiddlers start sawing away, and the couples on the floor start circling, skipping, and dancing their hearts away to "Square Dance Promenade." CLIFFIE STONE presents this music from a position of first-hand knowledge and experience. A musician, an orchestra leader, a promoter of country dances for many years, Cliffie has a deep understanding of both the music and of the dancers' desires and needs. BILLY LIEBERT, his good friend and long-time associate, has written arrangements that retain the traditional elements of each tune, yet his unusual orchestrations give them all a new flair with a good measure of added fun. STEREO NOTE: As you promenade by the bandstand, you'll find that stereo makes the music sound as though these instrumentalists are right there in person to play for your square dance party. Three fiddlers are heard left, right, and center, with solo guitar left, banjo right, and rhythm instruments grouped around center. LW3459: 9600 dpi jpeg from LP record purchased 2018 by Leon Worden.